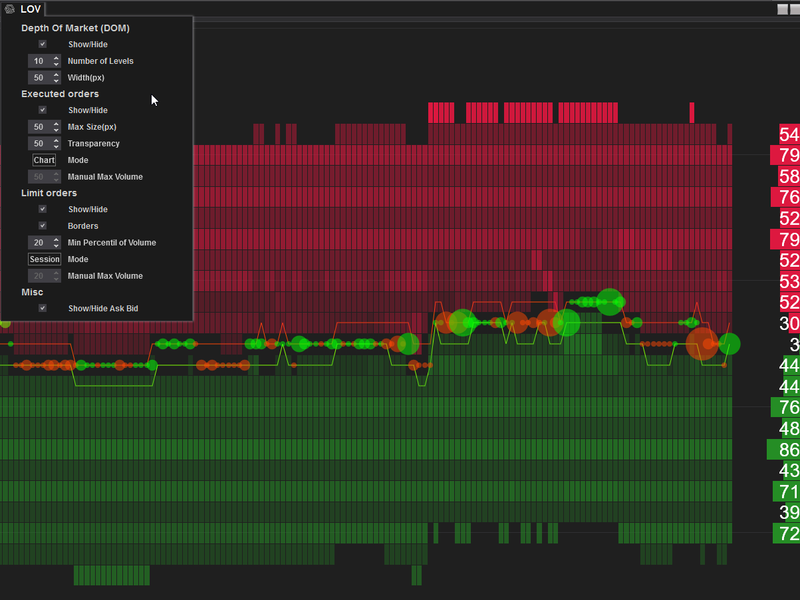 View in real-time the Orderbook, executed trades, limit orders, and the bid and ask spread. Change the settings without refreshing your chart. Add your favorite indicators to chart. 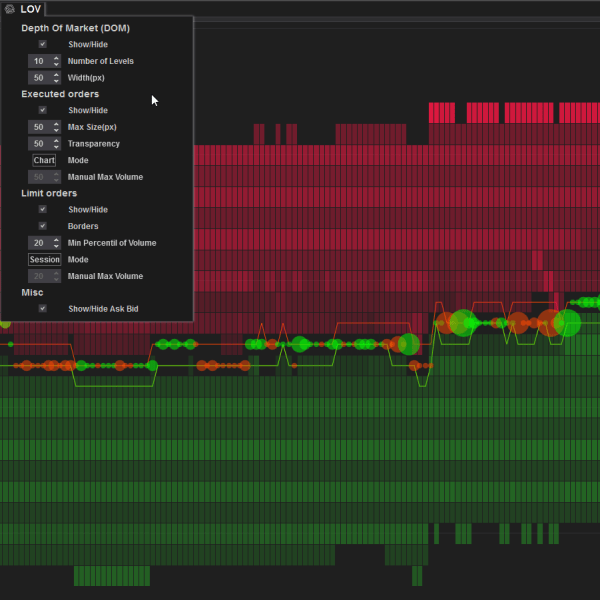 Limit Order Visualizer is compatible with Market Replay, thus you can review Orderbook action on your charts! 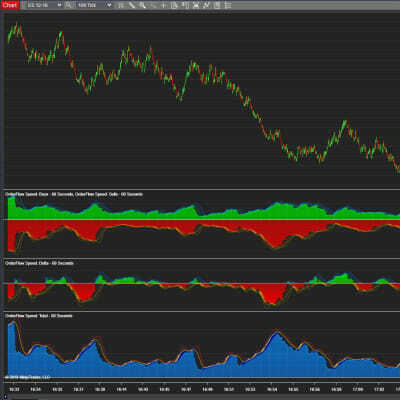 Limit Order Visualizer (LOV) is the most sophisticated tool to analyze the Orderflow within NinjaTrader® Chart. 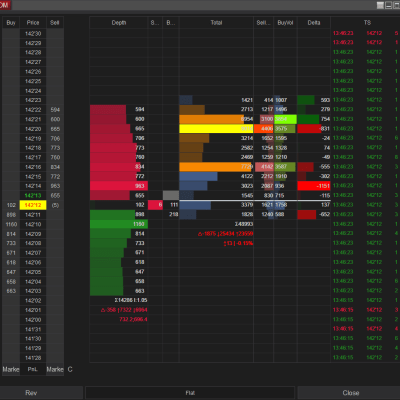 Most noteworthy it allows you to view level 2 Market Depth in realtime and historically (whilst the indicator is running) while being able to change the setting in real-time. Thus, you can spot changes in the depth of market that influence market participants and price. 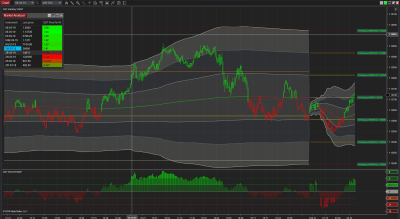 By using the native NinjaTrader® Chart you can add your favorite indicators to the chart an analyze how the limit orders behave at your price levels. 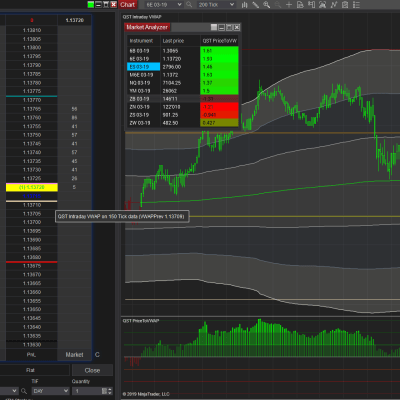 Limit Order Visualizer integrates into your chart so it adds a layer of information to your chart. Spot massive orders entering the market and removed in real-time. 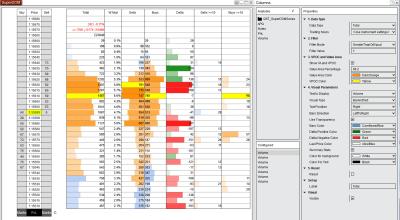 Limit Order Visualizer can help you clearly see what are the intentions of market participants. Very professional built. I would recomend to anyone. No regret in buying this i use 68 percentil to show me the sessions big orders. I place my take profits there. Very usefull for me. Reliable support. Thank you for the quick skype tour of the options, looking forward for the new versions. Like I said I’m using my own indicators with this indicator and see areas of confluence between them. Good stuff! Compatibility Compatible with NinjaTrader® 8 only. Requires Tick Data and Level 2 Data to be fully functional. Updates We provide free lifetime updates to our existing customers. Continually adding value to the product. When a new version is released you will receive an email in your inbox and you will be able to download accessing your Account under Downloads Tab. Past versions will also be available. We strongly recommend that you remove all previous versions of the product before installing a new version. -Fixes in OnRender code -Fixes on Tab and Window duplication -Added possibility to limit the number of levels "Max Levels to watch" for Data providers that supply historical depth. 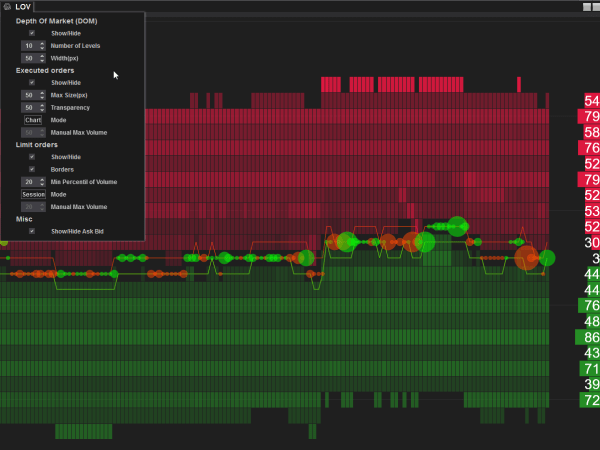 View Market Depth activity and significant limit orders! Change the settings in real-time without losing information. Adaptable to current session and chart view. 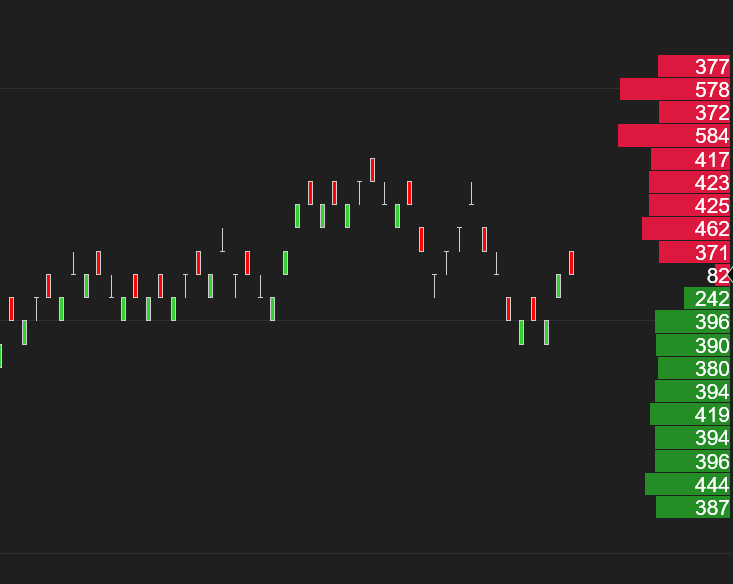 Display or hide the Real-Time OrderBook. Set the number of levels of the OrderBook To Display. Set the maximum Width in pixels for the OrderBook. Display or Hide the Executed Orders. Set the maximum size for the Executed Orders circles. Set the transparency for the Executed Orders circles. Choose between Manual, Session or Chart mode to make the size relative to your choice. In manual mode set the maximum value to which all other volume will be relative to. 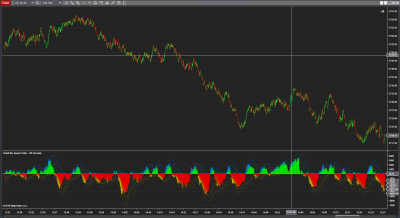 Allows you to view the movement of limit orders real-time and historically. Display or Hide Limit Orders. Display or Hide Limit Orders borders. Choose the setting to your visual preference. Choose the percentile at which orders will be displayed. Toggle between Manual, Session or Chart. This setting allows to determine the what is the point of reference for your visualization. When in manual mode this setting allows to set the maximum value. Risk Disclosure –Futures and forex trading contains substantial risk and is not for every investor. An investor could potentially lose all or more than the initial investment. Risk capital is money that can be lost without jeopardizing ones’ financial security or lifestyle. Only risk capital should be used for trading and only those with sufficient risk capital should consider trading. Past performance is not necessarily indicative of future results. CFTC Rules 4.41 – Hypothetical or Simulated performance results have certain limitations, unlike an actual performance record, simulated results do not represent actual trading. Also, since the trades have not been executed, the results may have under-or-over compensated for the impact, if any, of certain market factors, such as lack of liquidity. Simulated trading programs, in general, are also subject to the fact that they are designed with the benefit of hindsight. No representation is being made that any account will or is likely to achieve profit or losses similar to those shown. Testimonials – Testimonials appearing on this website may not be representative of other clients or customers and is not a guarantee of future performance or success.